My dad was a teaser. All my childhood foibles were fodder for his jest. I wanted ammunition of my own. I went to my grandmother and asked, “Tell me something my dad did as a kid.” She laughed and told a story. They lived on a farm, where, among other things, they planted corn by hand. Dad got tired of planting one day, but still had seed left. He dumped it all in a hole at the edge of the field, went to the house and declared he was done! In a few weeks his indiscretion was visible to everyone. He got a whoopin’ for that one. Finally, I had something on him. Satan, the enemy of our soul, is looking for ammunition to use against us, too. And not in a playful way. We are warned, “Be careful! Watch out for attacks from the Devil, your great enemy. He prowls around like a roaring lion, looking for some victim to devour,” (1 Peter 5:8, NLT). Satan’s goal is not to tease, but to steal, kill, and destroy (John 10:10). But through vigilance and repentance, his accusations are meaningless. We are more than conquerors (Romans 8:37)! Through daily prayer, Bible reading, and repentance, your soul can be safe. Do you feel harrassed by Satan's accusations? How do you deal with them? 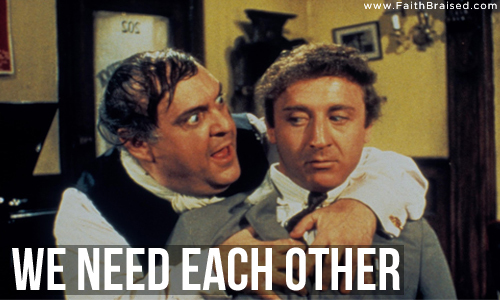 Do you share your struggles with others? Have you discovered helpful strategies for silencing Satan? Please share your experiences and ideas in the comments! And my blog has hit more than 200,000 total views. Growing up, my family frequently took the once traditional driving vacation in summer. The four of us—me, mom, dad, sis—loaded into the Olds and took off across the country. Each year we went the same direction—away. Since the car didn’t have A/C we looked forward to stopping at a Stuckey’s or any other tourist trap site to cool off and de-stickify ourselves. And every motel we stayed in had to have a pool—that was my requirement. When you’re inside a car with vinyl upholstery, no air conditioning, two kids who love to pick on each other, and it’s 80+ outside, dad didn’t need to use curiosity as an excuse to stop. The promise of time spent in the cool got everyone’s attention. The tour was cool, totally cool, taking us deep into the heart of the earth. The huge rising stalagmites and hanging stalactites were awesome, especially as they were enhanced by colorful and dramatic lighting. Every twist and turn of the path brought appreciative ooohs and aaahs. At one point during the tour, to give us a full appreciation of how dark a cave really was, the lights were turned off. We were instructed to take the hands of companions, parents, and children, and not to move an inch. The lights went out and it truly was The Big Dark! Being the proud little man that I was, I pulled free of dad’s hand to scratch my nose and shift my feet a bit, turning around trying to see in the darkness—just for a second. I was brave—just for second. Then I reached for the comfort of a hand again. When the lights came on I quickly sensed something was wrong. I was horrified to discover that I wasn’t holding my dad’s hand. It was the hand of a stranger and dad was nowhere immediately visible. Actually, he was only a few feet away—but there were a lot of other feet, legs, and adult bodies towering all round me and I was only about four feet tall! To me, a wee kid, he may as well have been eons away. That moment—and it was in reality only a moment before dad reclaimed me—gave rise to terror, confusion, bewilderment, remorse, regret, and a rush of other emotions. I was stunned that my momentary letting go of dad’s hand had put me at terrible risk and at such distance from him so quickly. David, the author of many of the Psalms and who spent some time in caves, is a fascinating biblical character for a lot of reasons. What I find most amazing is what’s said of him by God: “After removing Saul, [God] made David their king. [God] testified concerning him: ‘I have found David son of Jesse a man after my own heart; he will do everything I want him to do.’” (Acts 13:20-22). God says David is “a man after my own heart; he will do everything I want him to do.” Does that mean David never made a mistake? Not at all. We’ve got nearly the whole scoop on his failures and misdeeds in the Old Testament. David did all God wanted him to do, and a few things He didn’t. Some of those things were tragic. Yet, through it all, David still was a man after God’s own heart. As a deer pants after the water, so David’s soul longed and sought after God relentlessly, through success and failure, through blessings and woes. So it should be with us and our relationship to our heavenly Father. How many times each day throughout our busy weeks and months do we play the proud Prodigal and do our own “brave” thing? Each decision—insignificant or momentous—gives us the opportunity to hang on to God’s hand in utter dependence, or let go and go our own way to never good consequences. If we let go, when we come to our senses, the distance between us and God feels like a boundless chasm of guilt, shame, and regret. Yet, the reality is that He never is very far away at all. Going through life can be like walking through an unfamiliar room lit with a strobe light—with the lights constantly turning on and off. 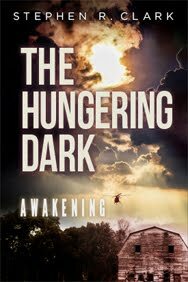 We confront people and situations which bring both darkness and light in rapid succession. It can be disorienting and exhausting. Our ultimate goal is to get from one side of the room to the other in one piece—to move through our lives holy and preserved. But there are a gazillion unseen hazards seeking our hurt. The constant and disorienting moving from light to dark to light to dark forces us to press on in faith because we can’t always see clearly where we’re going or what’s in front of us. As with David, our hearts long after and draw us toward God, yet there are moments our self lets go of His hand and we do those things He never intended for us to do. We end up standing in the dark holding the wrong hand. In the cave, when the lights came up and I realized my situation, you could say that I became a boy hard after my dad’s own hand! While in my tiny act of rebellious independence I’d let go, I was still my father’s son and coveted his protection and care. My hand was in another’s, but my heart belonged to my dad. So it is even now. Our lives become flawed by sin, yet we’re still people after God’s own heart. The stains of sin are not indelible when washed in His blood. With Paul, we can say, “I do not consider myself yet to have taken hold of [perfection]. But one thing I do: Forgetting what is behind and straining toward what is ahead, I press on toward the goal to win the prize for which God has called me heavenward in Christ Jesus” (Philippians 3:13-14). God is loving, faithful, and patient. When we pull away, He’ll let us go. When we wake up to our folly, His hand is always right there, open, reaching toward us. But better yet, why even pull away at all? There’s nothing wimpy about dependence on God. Real men and women aren’t afraid to be seen holding His hand tightly. Are you? Can you relate? Do you sometimes let go of God’s hand and turn your own way (see Isaiah 53:6)? How does it feel when you’re in the dark? When the light dawns again, do you feel immediately close to God or does it take some time? Please share you experiences and thoughts in the comments! Every encounter with a friend is an opportunity to be blessed and be a blessing. Being visited by a friend is a validation. The very act of them coming to see you speaks of their love and care for you. When they come seeking comfort, it’s an opportunity to reflect love and care back to them. While living alone some years ago, from time to time, a friend who lived a few hours out of town would ask to spend the night at my place. He sometimes had very early meetings following a late night of work. But it made no difference how late he arrived, we always spent 2 to 3 hours talking. One of us was always in need of a little encouragement. Each visit yielded new spiritual strength and refreshed faith. Yet, all that was taking place was two friends talking about ordinary life stuff. Yet those late hours of sharing are priceless treasures in my bank of memories. Paul shared, “One of the things I always pray for is the opportunity, God willing, to come at last to see you. For I long to visit you so I can share a spiritual blessing with you that will help you grow strong in the Lord. I’m eager to encourage you in your faith, but I also want to be encouraged by yours. In this way, each of us will be a blessing to the other” (Romans 1:10-12, NLT). Every encounter with another person is an opportunity to have your faith encouraged, as well as for you to offer encouragement. Who are your reliable friends? Do you get together often or rarely? Was there a time in your life when you had great friendships? Bad friendships? How are you a friend to others? Share your experiences and thoughts in the comments! All this sounds great, right? I’m all for love. 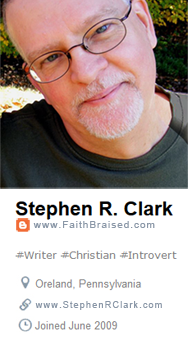 In fact, I often quote 1 Corinthians 13 in part or in whole to make a variety of points. Most recently highlighting the first part of verse seven that, in the NIV, states, “[Love] always protects....” because there are many in the world who need protecting. Most importantly, 1 Corinthians 13 offers a lot of content defining key aspects of love, a love you can believe in. Of course, advocating for love requires that what you mean by “love” is defined. Especially given the fluidity of the English language and how casually we toss the term around to identify our favor of just about anything. There are many who “love” to do things that are considered cruelty and felonies. We love our pets. We love ice cream. We especially love specific flavors of ice cream. We love a certain type of music, a sunset, a particular fabric softener, a scene from a movie, a special book, a favorite author, our car, our spouse, our guns, our nation, and on and on the list of loves goes. God may even be on it. Clearly, Miranda was wrong because, if we’re honest, love is not love is not love is not love. There’s a lot of qualifying required. And this gets to the heart of the problem I have with McLaren’s book. He votes for love in faith yet wants to toss out any system of belief behind faith. He tries to claim that love is the true Jesus-inspired content of faith, and that beliefs (doctrine, theology, etc.) are not needed. How do you know what generous is? What are you contemplating? What does compassion look like? All of these require definition to be meaningful and purposeful. Otherwise all that’s left is an empty, ambiguous, content-less “thing” that you slap the “love” label on and hope for the best. Without the defining of beliefs, love becomes meaningless. I don’t think that’s what McLaren is aiming for, but it’s what his book, generally speaking, offers. Even Jesus declared that to be true to Him we need to believe in Him, and faith comes from hearing the content of belief. Having heard about McLaren over the years, when I was given the opportunity to review his book, I thought why not. 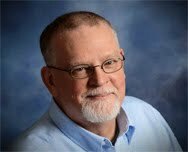 He’s a key driver behind what is referred to as the Emerging Church. Or is it Emergent? Some say they’re the same, some say they’re different. I say however you label it, what McLaren is touting is not biblical. Sure, he makes some valid points about the problems you’ll find in Christianity, past and present. There’s nothing new here. And the problems he points to are not expressions borne out of deep-seated theological errors in the accepted orthodoxy of belief. But rather they are the erroneous expressions of sinful people applying orthodoxy in anti-orthodox ways. They are the result of good people doing bad things even despite holding good beliefs. The bottom line is that McLaren seems to want to throw the baby out with the bathwater, yet he does like the tub. By that I mean he likes some of the trappings if Christianity, such as gathering together in what most of us call a church. Okay, that’s nice. But I wondered, “Drift from what?” If you scuttle beliefs then to what are you moored? You can say you’re moored to God, but even then the god to whom you claim to cling needs the substance of definition, or otherwise it’s an empty word rather than a saving Creator. This new book has the same feel. In fact, reading the rest of McKnight’s review, much of what he said about McLaren’s older book I thought about his newer book. 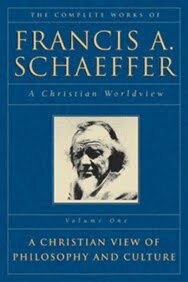 So if you want a deeper analysis by someone who’s a theologian (which I’m not), go read Scot’s review. 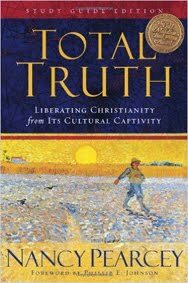 The sense I got reading McLaren’s new book is the sense I’ve gotten from reading a few others from “leading” Christians who have become disillusioned with the church and their faith. They’re in a “rich young ruler” kind of limbo. They want to the favor of God and the joys of the faith, but not the hard, prickly stuff that goes along with it. They want to feel good, and do good, and let this define them into being good, or rather, holy and heaven worthy. All on their terms, of course. The idea of, “Let’s just be loving and not worry about what we believe that means,” doesn’t work. It’s a rejection of both the milk and the meat of God’s Word and an embracing of an empty faith that really is not faith. There are several other issues with McLaren’s book. One huge issue is the way he lumps Jesus in as just another founder of a religion, a view that denies His divinity. Given this fundamental error it’s understandable that so much of McLaren’s thinking goes awry. I don’t recommend this book for anyone beyond those who, like me, were curious about McLaren and his thought. There’s nothing new here, and definitely no compelling case to “migrate” away from orthodox Christianity. My caution would be that if you do read it, don’t be sucked in. The truth is that love is not love is not love. Only Jesus is true Love and He’s the One worth believing in. 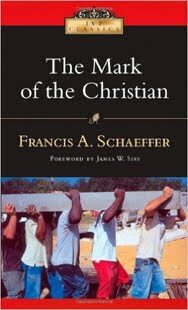 The only “better” way to be Christian is the way Christ exampled and advocated and His disciples taught and captured in Scripture. Are you a fan of McLaren? Why or why not? If you adhere to a life of love that’s not connected to beliefs or faith or church, how do you define “love”? Please share your thoughts in the comments! 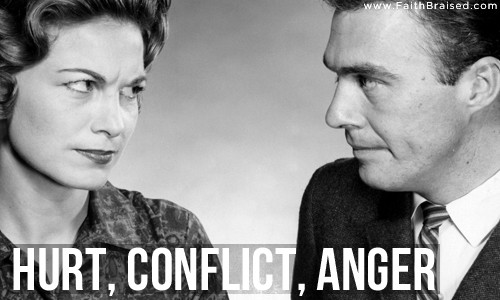 Life hurts, people make us mad, conflicts and anger ensue as we struggle to avoid pain. But the path around a dilemma is frequently not in avoidance or pain reduction. God delivers the gift of a trial to us and the correct response could be – are you ready for this? – to embrace it. To tough it out joyfully, sharing the pain with no one but Him as you wait for His deliverance, even if it never comes on your terms. Mining the depths of hurt and anger with tools given through the Holy Spirit can yield the most precious jewels. These are the gems of experience, maturity, and wisdom with which He adorns your life as He quietly heals the hurts. When they come, if all you do is struggle against troubles, you may miss the opportunity to grow and be strengthened in grace and mercy. In fact, you just may miss Him. The Bible advises, “Don’t sin by letting anger gain control over you. Think about it overnight and remain silent” (Psalm 4:4, New Living Translation). God walks with you through troubles and joys. Are you hurting? Have you been hurt before? How did you arrive at healing? Do you think you can do it again? Why or why not? Share your experiences and thoughts in the comments! In the fall of 1972, I was a junior in college, frustrated with the Vietnam War, and growing increasingly leery of the then President Nixon. I was not a politically minded person at all, but I felt compelled to take a closer look at things. The upshot was that this conservative Pentecostal Hoosier hayseed who grew up in a Republican home became attracted to George McGovern. Gasp! Looking back, I guess in some ways he was the Bernie of the times. I wasn’t completely comfortable with everything he stood for, but instinctively knew our country needed a change from what we had. I got involved on our small Christian campus with the brave, the few, the proud who were rooting for George. My family would not be pleased, but hey, I was in Missouri and they were way back in Indiana. Plus my involvement was mostly in stealth mode. Sadly, through a series of fumbles, McGovern’s star faded and Nixon headed into a second term. A term that, despite some bright points, ended disastrously. Which was kind of the way I felt about my first venture into political involvement. While the results of the ‘72 race were disappointing, the lesson I learned was to keep an open mind and think outside the party. In other words, instead of voting a straight ticket, I discovered that the better choices may be one from column A, two from column B, and maybe even a couple from column C.
Since then, while I’m no political savant, I’ve tried to become a little more politically savvy. Sorting through the hubbub isn’t easy but it is worthwhile. Sometimes the candidates I like win, often they don’t. In the Presidential category, the best choices seldom make it past the primaries. This year, however, for me, both major party choices were beyond “nope,” beyond merely “bad,” and registered on the political “evil” scale. The two major party candidates that survived the primaries this year bore “bad fruit” by the bushels full. The leading third-partiers were just mushy and generally unpalatable. That is, until Evan McMullin got into the game late. He showed promise. The bottom-line was that I could not vote for either Donald Trump or Hillary Clinton. Instead, I decided to write-in in someone else, and did. Basically that means that once the primaries were done, no matter who won the election, all I had to look forward to was disappointment. Still, while I was and am frustrated (and probably will be for some time), I am not in despair and do not feel utterly helpless. I am discouraged and disappointed. I’m disappointed in my fellow Christians who chose to support Clinton, and especially those who chose to support Trump. It’s disheartening and baffling at the same time. But, I will not lose faith or hope. In my lifetime, I have survived 11 presidents and am now gearing up for number 12. They are Eisenhower, Kennedy, Johnson, Nixon, Ford, Carter, Reagan, Bush, Clinton, Bush, Obama, and now Trump. Reading that list I’m sure you will have your reactions to each one. Ones I’m fine with you may hate, and vice versa. That’s the way it goes for those of us who are citizens of these United States. You and I don’t always get what we want. One of us will always be disappointed. This year, in this Presidential election, once the primaries ended, there was no way I was going to get what I wanted, short of a miracle. That said, all I can do is live with what we now have. And I have to do that within the boundaries of my biblical worldview. That worldview tells me this is not “the end” and we can get through this together. If we choose to do so. Of course, on all sides, it will require grace, forgiveness, patience, forbearance, love, and several truckloads of kindness. To those who are on the “winning” side experiencing joy, please be patient with those on the “losing” side. The margin that has put you where you are is very slim and there’s little to gloat over. So, be patient as those who did not get what they’d hoped for vent, process, and mourn their loss. This was a long hard nasty ordeal and there’s no switch that can be flipped to just simply turn off the pain of loss. It’s going to take some much deserved time before healing can begin. To those who are on the “losing” side experiencing shock, I ask the same with some tweaks. Don’t let anger, hate, rage, despair, and all the dark emotions of life devour you. Cry it out and take the time you need to resettle your heart and mind. And then come back to fight the good fight some more. But fight it with love in your heart, not resentment. We need you at your best. As I said earlier, it was heartbreaking when McGovern lost. When Nixon fell, that hurt, too. But I survived and so did the country. Hopefully, some things got better. America is a big wacky dysfunctional family. Every four years it’s like trying to get everyone to come home for Thanksgiving dinner and then maintaining peace at the table. It doesn’t always go so well. But, for better or for worse, we’re still family. For those of us who are Christians, that image of family should give us pause when we feel like lashing out at fellow believers. And the example of Christ should give us pause when we feel like lashing out at those who are not believers like us. Losing hurts, but it does get better. Hate is not a good option. There’s still a lot of good work to be done. Perhaps that’s where we should channel our energies, regardless of who is or isn’t in the White House. Things may be bad, but I don’t want to do anything that will make them worse. I want to move forward in hope. What about you? Are you experiencing shock or joy or something else? If joy, do you believe you can be tolerant and forgiving toward those in shock? If shock, do you believe you can be tolerant and forgiving toward those feeling joy? Why or why not? What ideas do you have for bringing healing and unity? Please share your thoughts and feelings and wisdom in the comments! 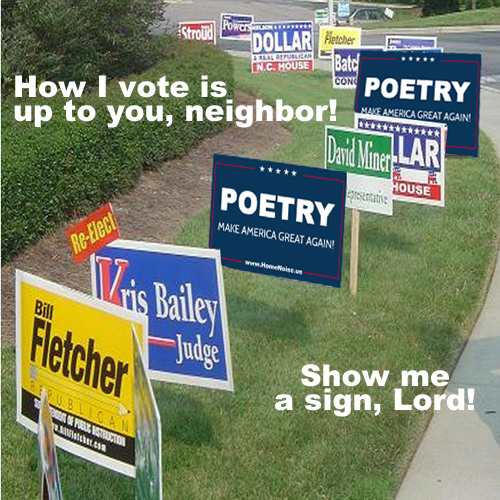 The Bible, politics, sermons & poetry: We need poetry to make America great again! Poetry is important. We are surrounded by poetry. It’s in the music we listen to (especially if you listen to Bob Dylan or Leonard Cohen). It shows up on TV and at the movies. 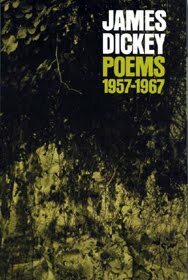 After all, “Poems are among us | seeking to make us fully | human” (see Anti-Pods). Poetry permeates our lives. This is especially true if you read the Bible. More than 8500 verses or around 27% of the Bible is poetry. Job, Psalms, Proverbs, Ecclesiastes, and Song of Solomon are all poetry. Only seven Bible books contain no poetry. 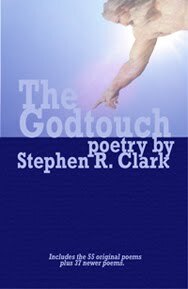 One-third or so of the entire Old Testament and many of the narratives and informational/doctrinal sections of the Bible are written in a poetic style. The Bible opens poetically, majestically, “In the beginning God created the heavens and the earth.” No, it doesn’t rhyme, but it is poetic. Why? Because it’s a huge idea. An enormous reality condensed and distilled into a few simple words. Those words hit the mind and explode the imagination. Even though there are substantially more words than in that first verse of Genesis 1, it is massive meaning packed into a small message. This is what poetry is. Big ideas, big meanings, big experiences, a big sense of wonder finely wrought. Kind of like us. Poetry is in our DNA. God is a creative being and expresses His creativity in mysterious and wonderful ways. Just look in the mirror! Poetry is His voice singing to us, His best Creation. 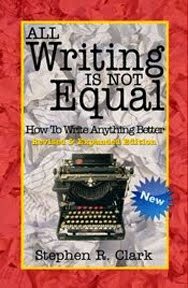 And when we write poetry, we are exhibiting and expressing His Spirit-enlivened image in us. When I write poetry my intention is to make it accessible and inspiring. To take what is considered mundane and reveal it’s hidden awesomeness. To write what connects with the heart and lifts up the imagination. 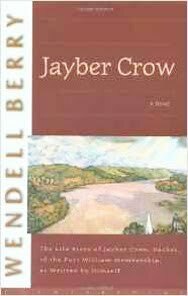 Or, as John Ciardi put it, “The concern is not to arrive at a definition and to close the book, but to arrive at an experience.” And, that, in some way, always points to the Creator behind the creation. Like a good sermon, a good poem brings forward the meaning intended by the writer, but also leaves room for the Spirit to activate deeper and personally unique meanings in the minds of the recipients. A good poem, like a good sermon, embeds truth deep into the heart. We could have used more poetry in our 2016 politics. 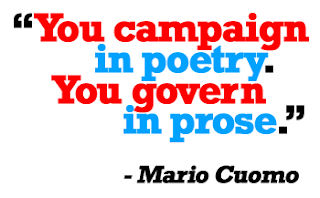 In 1985, Mario Cuomo claimed of political campaigns, “You campaign in poetry. You govern in prose.” Sadly, most of the recent campaigning has consisted of petty insults, whining, profanity, obscenity -- generally scabrous speech not fit as poetry or comprehensible communication. And when it comes to governing? Forget about it. Good prose connects people. There’s little good about what’s happening in our government or our daily discourse. Even without factoring Trump into the scene. 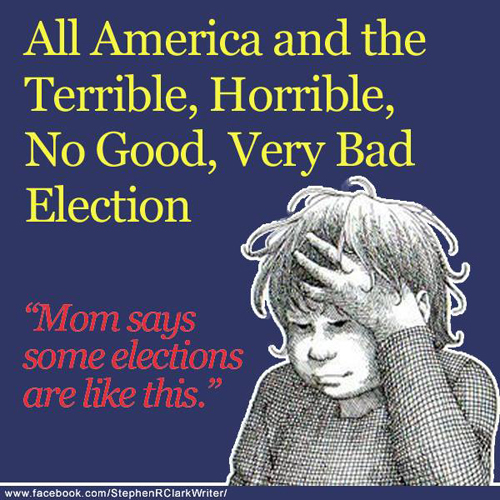 America has been and should be better than the candidates the electoral process throws up. 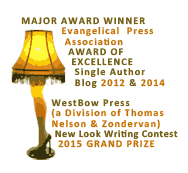 We are a nation created from great ideas expressed through poetic and uplifting language. We need to reclaim this positive founding spirit. 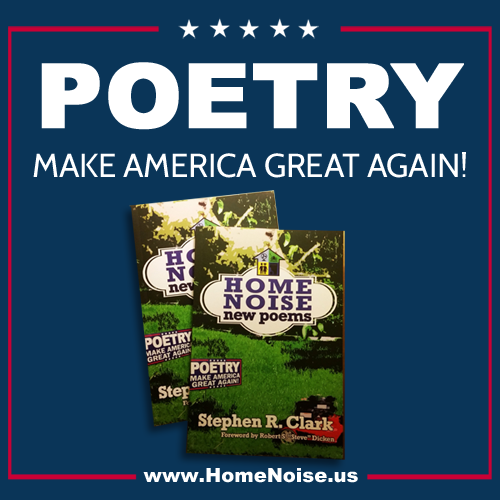 Perhaps, through poetry, we can make America great again! 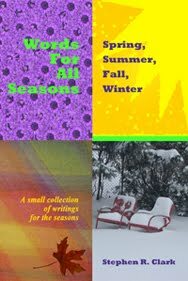 Poetry lifts up, inspires, expands vision, opens new channels of imagination. Write your own. We need more poetry to make America truly great again!. Do you like poetry? What do you like or not like about poetry? If you don’t like poetry, but read the Bible, do you have problems understanding or relating to the parts that are poetry? Who are some of your favorite poets? What is your favorite poem? Did you encounter any poetry in this election season? Please share your thoughts -- and your poems -- in the comments! 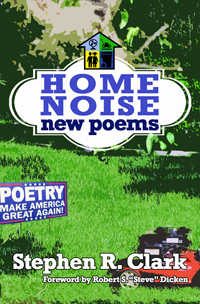 Note: This post is a slightly edited version of the Introduction to my new book of poems, “Home Noise : new poems”. Click on the image below to learn how you can get your copy of this new book of poetry for 30% off the retail price! (with a foreword by Robert S. "Steve" Dicken) is available now! When I was about 8 or 9 or so, our church held a revival. Revivals were pretty common throughout the year in my little church. During this revival, we were being especially challenged to believe God for healing. I had an ugly wart on one of my fingers. It was embarrassing. Kids made fun of it. 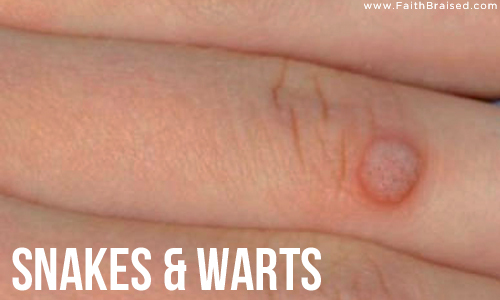 The daily applications of wart remover weren’t doing the trick. I wanted it gone. “As long as it takes!” he replied. After about the third night of prayer, the wart vanished. I knew God had healed me because we had stopped using the wart remover. I was amazed and learned perseverance in faith. If at first you don’t receive, pray again. And again. After all, “You fathers—if your children ask for a fish, do you give them a snake instead?” (Luke 11:11, NLT). Do you believe prayer changes things or that prayer changes you? Have there been issues in your life that you prayed about and you feel the prayer wasn’t answered? Did you stop praying about it? Have you received answers to prayer? Share your thoughts and experiences in the comments! How I'm deciding for whom to vote: It's in your hands, neighbors! It’s been a long nightmare -- uh, I mean process -- that takes a new direction tomorrow. No, it won’t end, it will just get weirder no matter who wins. Deciding who to vote for has not been easy. There are so many, mostly very obnoxious voices declaring which candidate is the best choice. Particularly among those claiming to be Christian voices. The arguments for supporting a certain candidate -- who will not be named -- have been outrageous, insulting, demeaning, increasingly hysterical and desperate, and always incredibly convoluted. Yet none have been especially convincing. And not very Christian. The other, allegedly one of only two viable choices, is not appealing either. At all. While there are third party and write-in choices that are more than palatable, I’m told in no uncertain terms that a vote for one of them is a vote for the devil and I’ll have hell to pay. Great balls of fire! Holy change is a-comin’! It's amusing to watch Christians just say no to change by invoking the Holy Spirit. The great irony of stonewalling change by pointing to the Holy Spirit is that the Holy Spirit is the greatest, all-time, radical change agent. When the Holy Spirit blows in, nothing remains the same. Nothing. I’m guessing that the appeal to the Holy Spirit as a block to change comes from a misunderstanding as to what we're dealing with. Or rather, Who we're dealing with. The Holy Spirit is not an “it” or a feeling or a shot of spiritual caffeine. The Holy Spirit is a person. He is one of the big three-in-one. Remember the Trinity? You know, God the Father, God the Son, and God the Holy Spirit? A lot of Christians, as they settle into their sedate Christian walk, begin to view the Holy Spirit as some kind of gentle giant. A nice “force” to be with you as you journey through life. A sweet secret prayer language. A spiritual lucky rabbit’s foot in your pocket. A subtle suggestion from the proverbial good angel on your shoulder. A feeling or twinge of conscience to keep you on the straight and narrow. All of these ideas are wrong. First, there was the sound of a mighty -- violent -- rushing wind. There was nothing gentle or breezy about it. Think tornado. Next, balls of fire that appeared as tongues landed on everyone’s head. Great balls of fire! On their heads! Then, they all began speaking in foreign languages -- languages they were not schooled in and did not speak before this. * They were apparently a little loud, too, as people around the neighborhood came running to see what was happening. A lot of people. Finally, empowered with this freshly poured out Spirit, Peter preaches a powerful sermon that cuts the hearers to the quick with conviction -- it splits their hearts wide open. As a result, about 3,000 of these bystanders became believers. Three thousand! And nothing has been the same since. So, the next time a new idea pops up in church, you may not want to defend against the change being proposed by suggesting everyone checks in with the Holy Spirit first. You may get exactly what you don’t want and weren’t expecting. In fact, if you’re sensing the need for change in your life, in your church, or in your world, the best thing you can do is invoke the Holy Spirit. Change will come. In a really big way. Because the Holy Spirit is a really big, really noisy, really powerful Guy. What’s new with you? Anything? What about in your church? 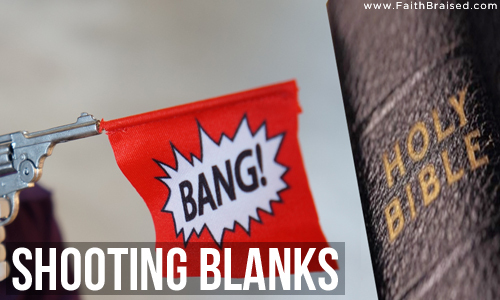 Do you believe the Holy Spirit is active in a church or a life where nothing new happens? How do you view the Holy Spirit? How do you engage with the Holy Spirit in your daily Christian walk? Please share your thoughts and differing opinions in the comments! * Some will argue that the speakers all spoke in their own languages and those hearing heard in their own languages. That doesn’t dampen the power that was present. Regardless of how it happened, it was a very big, very radical deal. “Life is difficult.” So begins the bestseller, The Road Less Traveled by M. Scott Peck. Once the teen years slip behind us, the reality that life doesn’t always go the way we anticipated becomes increasingly clearer. So what if from time to time my life has been sideswiped by someone else’s hurtful choices or my own willful detours? Who hasn’t suffered, or caused suffering? The bigger truth is that life is not one dimensional. On the flip side of sorrow, loss, and failure there is joy, success, and fulfillment. All that comes into my life is a gift from God. The negatives teach me how to better appreciate the positives. The Psalmist puts it like this: “You have allowed me to suffer much hardship, but you will restore me to life again and lift me up from the depths of the earth” (Psalm 71:20, NLT). Kind of like new growth in a burned out forest. It all comes back eventually. The bottom-line is, even when life hurts, God is always good. 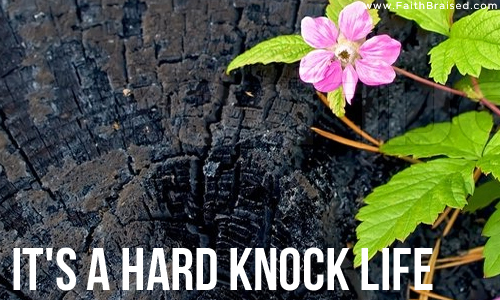 How have you handled the hard knocks of life? Do you continue to carry the pain of the past or do you look forward toward a better tomorrow? Share your thoughts in the comments!